Opening Prayer: Our loving God, You want all good things for Your people and You give us treasure beyond compare in Your love and in Your word and in Your son Jesus, the Christ whom we follow. Grant that we may cherish your Gifts and bring ours to you so Your kin-dom may come. We ask this in the name of Jesus who lives with You and the Holy Spirit, One God, forevermore. Amen. Today Jesus teaches us that there is treasure to be found, and we might just stumble across it; there are priceless pearls found when we search for them; and there are fish aplenty though some may not be tasty. In the words of the Epistle to the Romans(8:28-30), when we love God “all things work together for good” for us. And when we find the treasures of the kin-dom, they are worth everything. How wonderful is God’s giving to us. I treasure the very few things that I received from my Grandmother Ella and Mother Anne that have survived the many decades since I was a young girl. Both gave me the intangible and enduring gifts of unconditional love and faith. They loved me no matter what. And their faith in God was passed down to me as their legacy. Those are gifts without price that made all the difference in my life. Over the fireplace in our living room there was always a little 3″ by 4″ plaque framed in gold leaf, with pine cones and little fir boughs in two corners that said: “All things work together for good to them that love God” (Romans 8:28). I have it before me now. We knew poverty and illness and good times and bad times. My Grandmother would comment as the bad times passed-”It all worked together for good,as God said”. Sometimes I couldn’t see it, especially at times of loss and grief or change. But in time it was evident. What a priceless gift! As Mr. Gary, our church Elder, often says: God’s got your back! Wow! In the first reading from Kings(3:5,7-12), Solomon asked only one thing of God, a wise and understanding, discerning, heart, and God granted his prayer. That was his treasure, his gift from God and he gave it back in good measure. Many of us who counsel others have prayed that prayer in the midst of life’s complexities and challenges especially when we struggle with helping those who are hurting and upset. It is lovely when that prayer is answered. Sometimes the greatest treasures are found when we are not looking for anything. 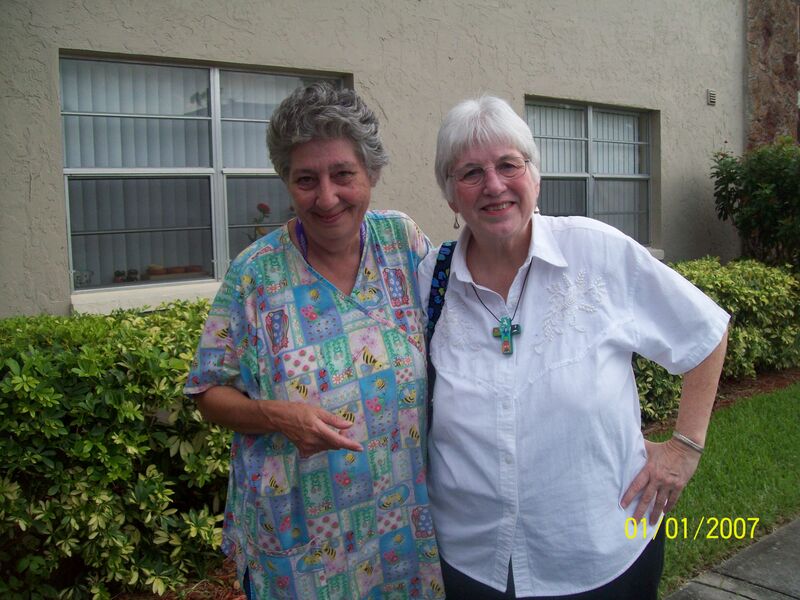 Pastor JudyB and I stumbled across the treasure of serving the homeless and hungry in Fort Myers when the City Council threatened that no one could feed people in the park. We went out to join those at Lamb of God, A Lutheran and Episcopal community, doing just that. And out of that, our whole ministry and church has developed. We stumbled across the treasure of God’s people. We were also actively searching for a way to serve and to enact justice and love. We found the way, for us the pearl of great price, in developing the ministry of the church in the park and then the church in the house. We also cast out our nets and hauled in a lot of fish over the years of becoming the Good Shepherd Inclusive Catholic community. Not everyone stayed with us, some swam away of their own accord and some died as we tried to help them. But look at the haul, look at the people we serve, for us that is the treasure and the pearl of great price. You, our people, are the treasure, our church is the pearl of great price. The pope will be with us the Friday, Saturday and Sunday of that week," he said. Ask me for something and I’ll give it to you? to choose the wisdom of Solomon? and ask for the buried treasure, the pearl of great price? the buried treasure and the pearl of great price. because of its message of exclusion at the end of time. what the lesson is for us here and now. that for which we would give everything we have? to get up and go each morning. leaves a hole in the fabric of relationships in my life. for me and for many other people. of an interview with a young man hospitalized in Gaza. no one left,” he said. His priceless treasure had been senselessly stolen from him. blown to pieces and strewn across a farm field in the Ukraine. for us as a community. and, indeed, of all creation. we’re exploring the theology of ecology. of the ways we are treating our environment. the environment that sustains us. We’ll bring out science, we’ll use the internet—the new stuff. from farming and life in villages—the old stuff. We’ll personally have to change our lifestyles and habits. the pearl is worth the price. When we share our love and support and labor the American dream comes true for families who knew hard times, poverty, homelessness and hopelessness. But now their hard work and partnership with Habitat for Humanity, Corporations, churches like Good Shepherd and many volunteers like Charlotte Williams and Debbie Carey has made dreams come true. 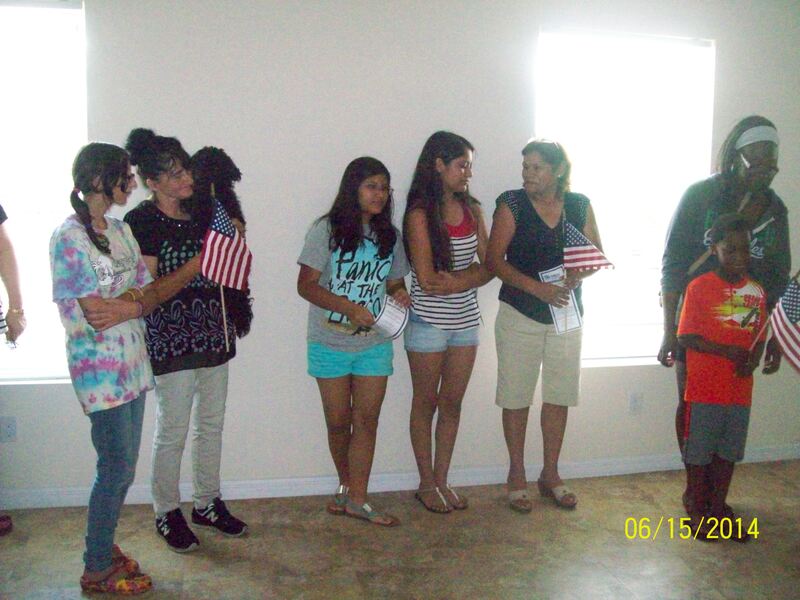 On July 18,2014 Pastor Judy Lee and Pastor Judy Beaumont blessed the houses of three elated recipients of Habitat for Humanity homes. 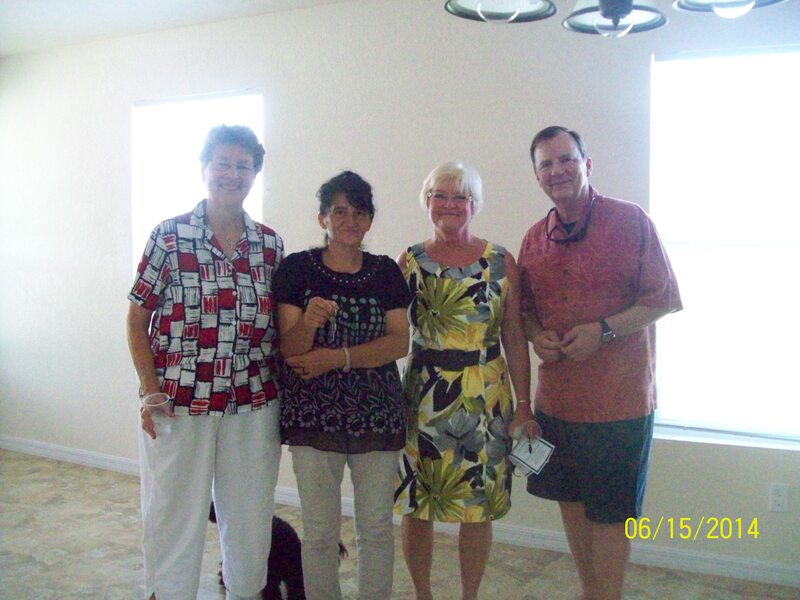 Our Liliana and Marcella worked very hard and was one of the happy families receiving the keys for their new home. Gaspare was helping with the move at the time of the pictures. Claire and Hank Tessandori helped to furnish Liliana’s home. 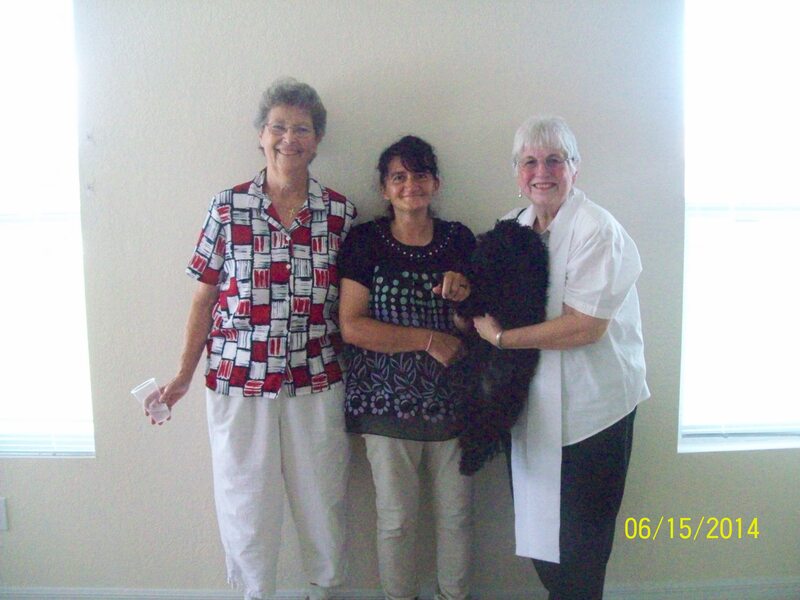 Carol and George, wonderful volunteers also came to help Liliana with home furnishings. THIS is the key! Thanks be to God! Jimmy Carter’s dream for affordable housing for everyone brought Habitat For Humanity into existence.. With the financing and labor of Corporations and the sweat equity of the families and their friends and churches the houses were built and the American dream came true for three families on this day. 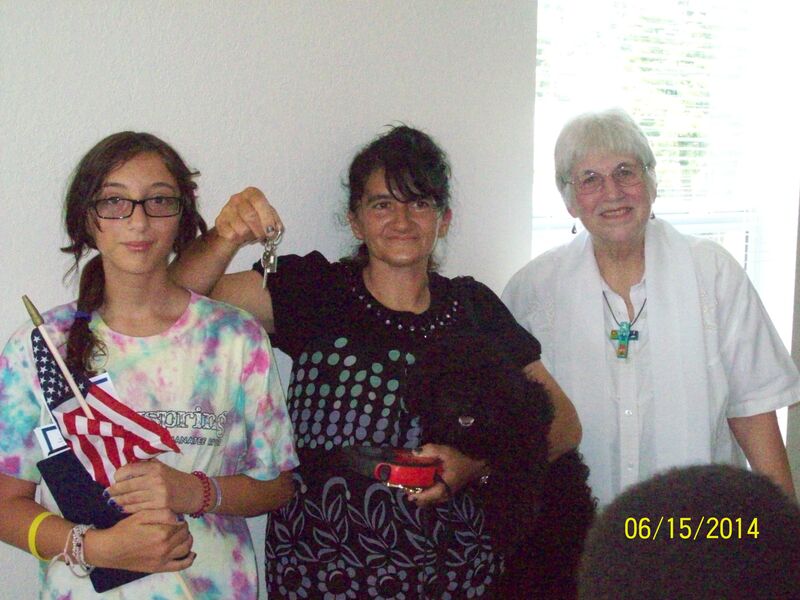 On Friday June 18,2014 our Good Shepherd Church Member Liliana with Marcella and their dog Spike at her side, received the keys to her own new home along with the families of Rosario and Seantai. It was such a joy to be asked to bless the houses of these three hardworking and wonderful families! 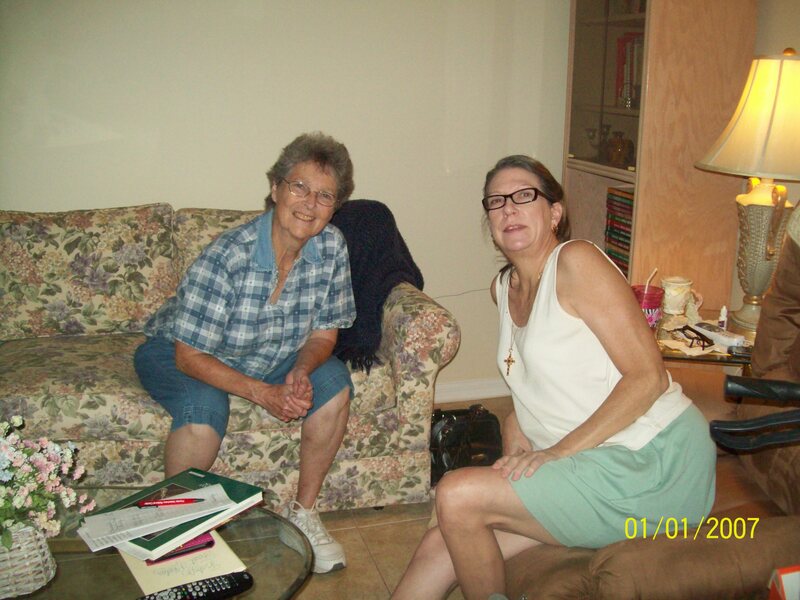 Here is Kathy and Pastor JudyB. in Kathy’s beautiful home! Kathy said that there is not a more beautiful word on earth than “home”. This is Ruby in her new home. She still cannot believe that everything is new. She said once, when I was a child I lived in a real home like this. I thought I’d never have one again. 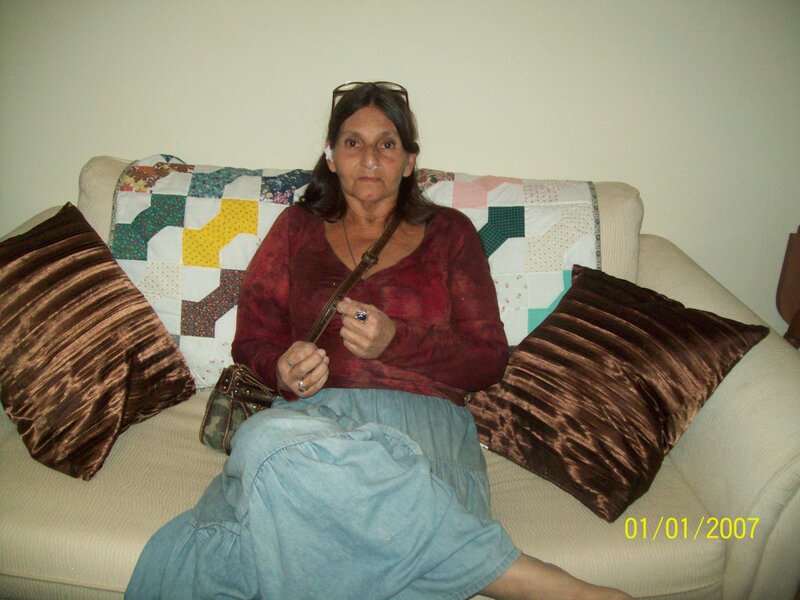 Thank God and Goodwill Industries for the physically disabled, and you both for my home. And Diane says she is happier than she has ever been in her new home. Her rent is high for her but she is showing us how she buys wisely and conserves her money. I am just fine, she says. Diane’s joy brings happiness to all she meets. How wonderful it is to have what everyone should have, a home and food to eat! Diane’s smile says it all, Thanks be to God! And, a special thank you to The Father’s Table Foundation that assisted us in helping Diane to have a home and all the furnishings. 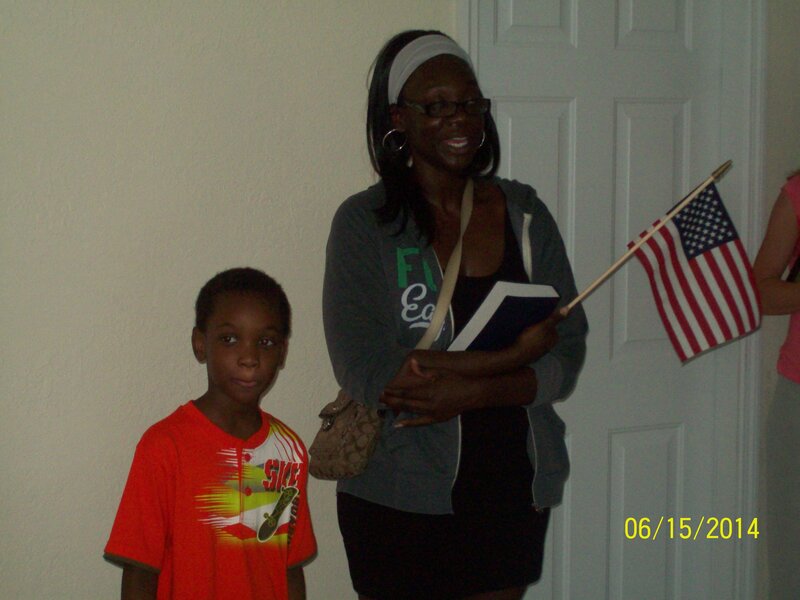 Thanks to Carol and George pictured above as well, for helping Diane with a new bed and several necessary items. 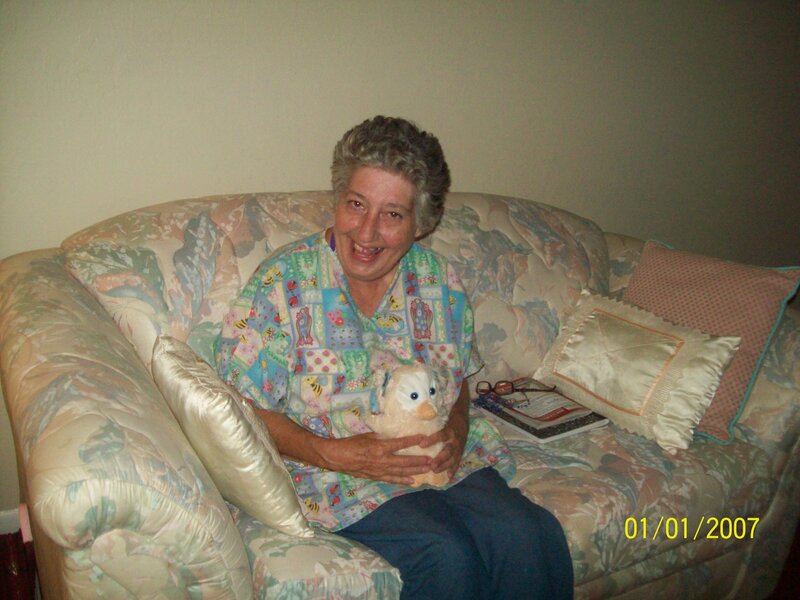 FREDON — She was a retired high-school biology teacher who loved gardening. She was also an excommunicated woman who was considered a radical by the Roman Catholic church, and a woman's advocate and “trailblazer” by her supporters and colleagues. Mary Ann Schoettly, who was ordained as a priest in a dissident ceremony six years ago, died Tuesday, confirmed her co-pastor, Michael Corso, of the Sophia Inclusive Catholic Community in Sparta. "It's quite a loss — it's so sudden," said Suzanne Thiel, of the Roman Catholic Womenpriests organization. Schoettly, who retired from Newton High School a decade ago, was ordained as a priest in 2009 by the dissident group Roman Catholic Womenpriests, according to news accounts of the time. She and others who underwent the ceremony were cut off from the church. 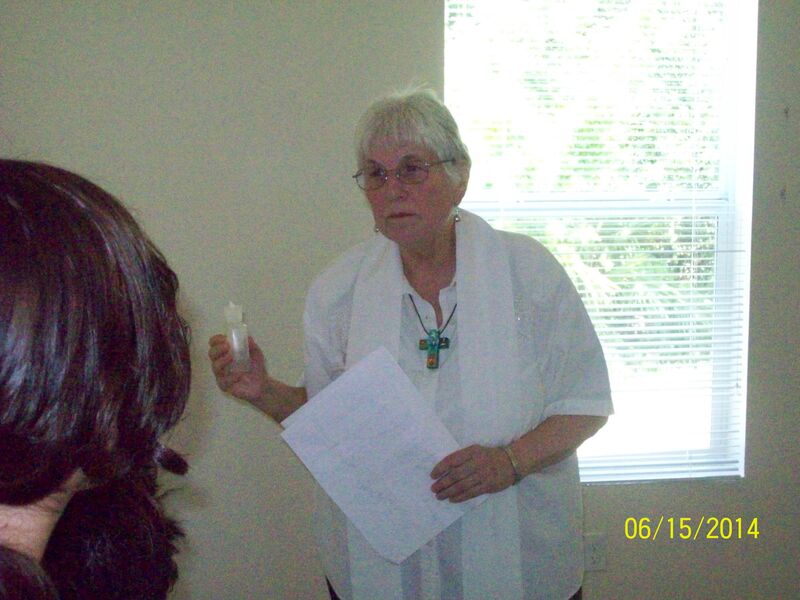 There are 150 such priests in the United States and 188 in the world, according to the Womenpriests organization. But the group of women refused to accept the excommunication decree. Schoettly and four other women who had undergone the ordination process traveled to the Vatican to take part in the proclaimed “Year of the Priest” celebrations in 2010. They held signs advocating for women to be accepted as priests – and drew some international media attention, she told reporters at the time. But there was also police attention. The group was detained by officers in St. Peter’s Square, and were held for several hours, during which their passports were confiscated, Schoettly told a reporter at the time. “Fourteen police surrounded us,” she said. “They’re worried about five women? I thought, ‘It says something. I’m not sure what,’ ” she added. Corso said Schoettly had remained as energetic and active in the community as she had ever been, until she became ill in recent weeks. 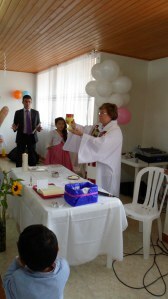 Her ministry had been quieter since the trip to Rome – but she was still leading her congregation, performing baptisms, weddings, and other ceremonies, he said. She received graduate degrees in theology, science and in administration and supervision, according to her local church. She also had certificates in pastoral care and spiritual direction. Schoettly is survived by three adult children. A wake will be held at the Smith-McCracken Funeral Home in Newton on Sunday, from 1 to 4 p.m., Corso said. Schoettly’s memorial service will be held at the Newton Presbyterian Church at 10 a.m. on Monday. Deacon Georgia Walker ARCWP Delivers Petition with 30,000 Signatures to Diocese of Kansas City/"A Call to Bishop Finn for Justice and an Apology To Colleen Simon "
"A petition supporting a church employee fired for being married to a woman made it to the Diocese of Kansas City, but not without some struggle. A petition drive in support of Colleen Simon acquired more than 30,000 signatures, said petition organizer Georgia Walker. Those who signed had asked the diocese to reinstate Simon, who was fired after "an irreconcilable conflict between the laws, discipline, and teaching of the Catholic Church...," according to a letter Simon received from the diocese after her dismissal. Walker and other supporters attempted to hand-deliver the signatures to the diocese, but were halted once they arrived inside the church's downtown headquarters. Somebody eventually took the signatured and promised to deliver it to Bishop Robert Finn. "These are concerned Catholic parishoners who are all here to say we've had enough," said Walker. "We want a change. We want a change toward compassion. We want a change toward acceptance and inclusivity." Simon married a woman in Iowa, and was fired in May after 10 months of work with St. Francis Xavier as its Parish Social Concerns Minister..."
Today I have delivered a petition to you signed by more than 25,000 individuals. We are asking that you apologize to Colleen Simon and reinstate her to the position at St. Francis parish. My reasons for doing this delivery are summarized in the following paragraphs. The Roman Catholic parishioners in the Diocese of Kansas City-St Joseph yearn to have a bishop-shepherd who leads with compassion, understanding, dialogue and peace. We pray for one who hears the voice of conscience and follows gospel values of Jesus of Nazareth, who was welcoming, inclusive, collaborative, forgiving and loving. We are weary of actions that reflect inflexible church rules despite the devastating consequences in the lives of sincere human beings striving to respond to God’s call to ministry. Colleen Simon is a gracious and loving person with many talents who was putting those God-given talents to work in service to the poor. Wouldn’t it be better to sit down with her, share your concerns and hear her perspective? Instead, it appears that you callously fired her from a ministry that she was performing with great success and much compassion. Some of us urged you to avoid a costly legal challenge and simply consent to enter into mediation so that you could both express your points of view and develop an understanding of the situation from both sides of the dispute. Why do you refuse to talk? We asked you to meet with the parishioners of St. Francis and those with whom she ministers even though many were deeply wounded by your abrupt decision to fire her. The injustice of the discriminatory firing deeply impacts our sisters and brothers of the Kansas City LGBT community and makes many of them feel unwelcome in the church. 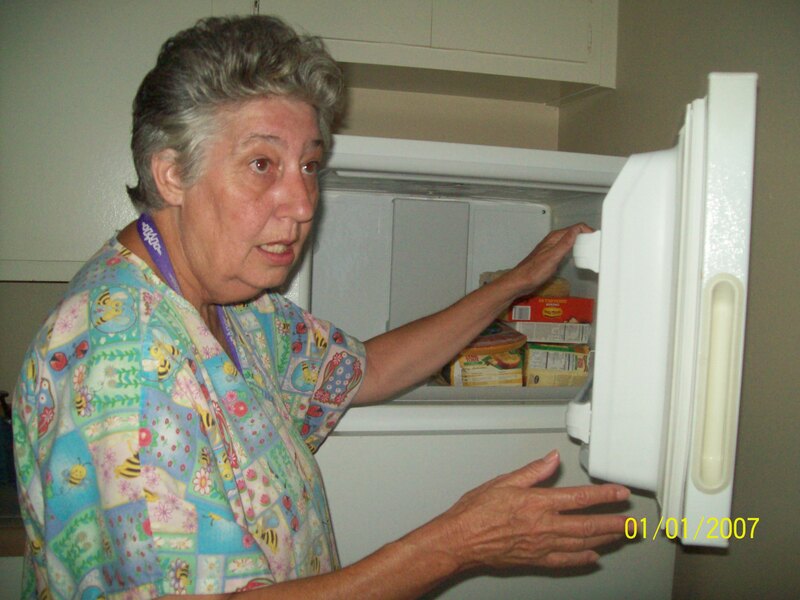 Moreover, Colleen was left with no job, no health insurance, and no access to unemployment compensation. Why do the men who are to gently lead the church not care enough for our own workers to participate in the Missouri Unemployment Insurance system! 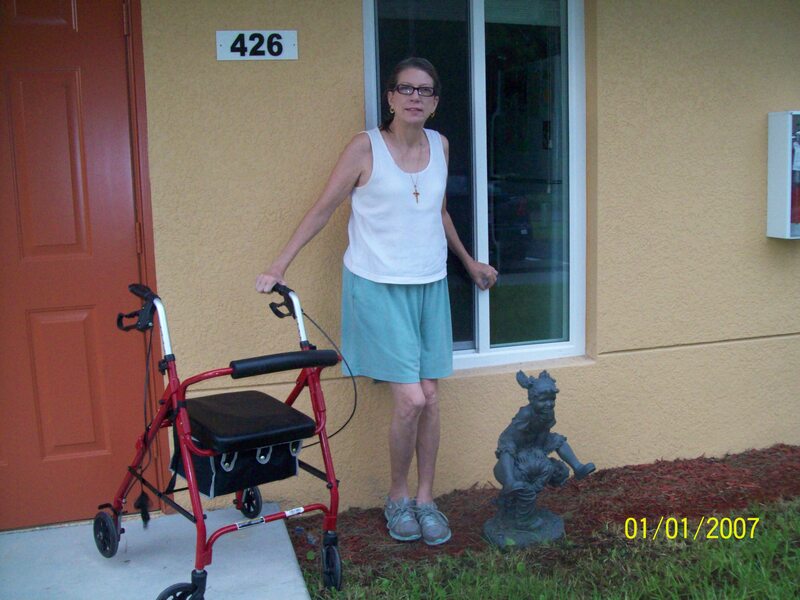 Colleen is a cancer survivor who still needs medical care. Please pray about that as you ponder why the parishioners of this Diocese are leaving the church in droves! Please read The Nonviolent Life by John Dear so that you might learn to act with more compassion and respect for the dignity of all God’s people! Jesus stood with the marginalized! Respectfully, I ask that you resign from your position so that we can participate in a more loving and inclusive Roman Catholic Church! All children and youth look forward to summer when the pressures and demands of the school year finally recede. Summer is a time of renewal and replenishment for them. When families live below, at or barely above the poverty level there are few resources to provide special experiences for enjoyment and social and spiritual growth. 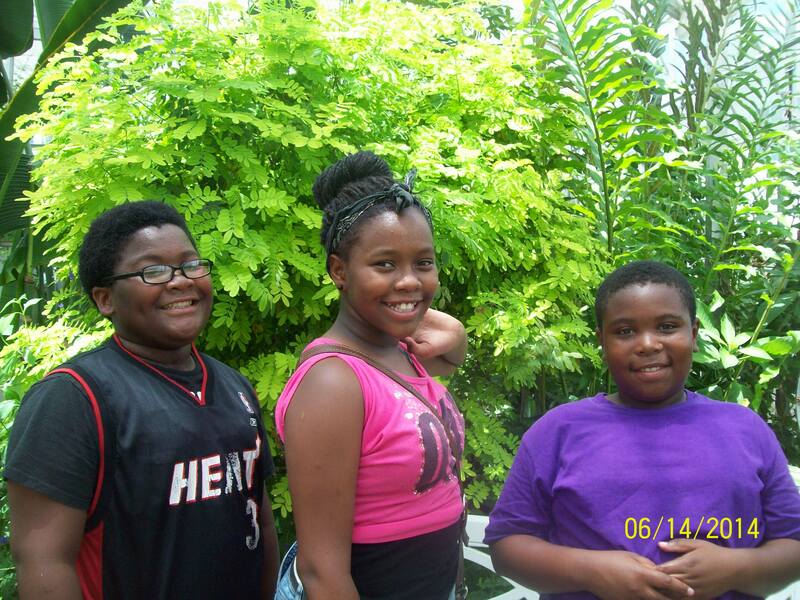 In Fort Myers, there are no free programs that children can attend. Hanging around the house all day to avoid the heat and rain is the primary alternative. But, thanks to a generous grant from The Father’s Table Foundation and donations of time and money from volunteers our Good Shepherd Ministries has been able to offer special trips and outings on a weekly basis in addition to meeting on Sunday afternoons to process and discuss the experiences. Part of this time is used for them to write and draw about their experiences and each will have a little book at the end. In various constellations according to age and reasoning we have thus far taken eight exciting trips and also provided funds for parents to take their children to special movies. In May we had the young people discuss, rank and vote on a list of possible trips. We are more than half way through their list as of July 18th. Thus far 15 young people have participated ranging in age from 5 to 18 with two others, 20 and 26. Our older youth are either leaders or special needs young adults. Additionally we have involved three parents as chaperones and leaders to give them enriching experiences along with their children. Other adults from the Ministry have also chaperoned. The parents process the experiences as well as the children and the learnings of all have been invaluable and precious. The first very special trip was for the teenage class plus one special needs 12 year old. It was a reward for excellent Sunday School attendance and academic accomplishments. We celebrated our High School Senior, Natasha Terrell who was graduated in May and Keion Lewis, age 12, who made wonderful success in reading and was promoted to Middle School. Five young people attended this trip ages 12-18. 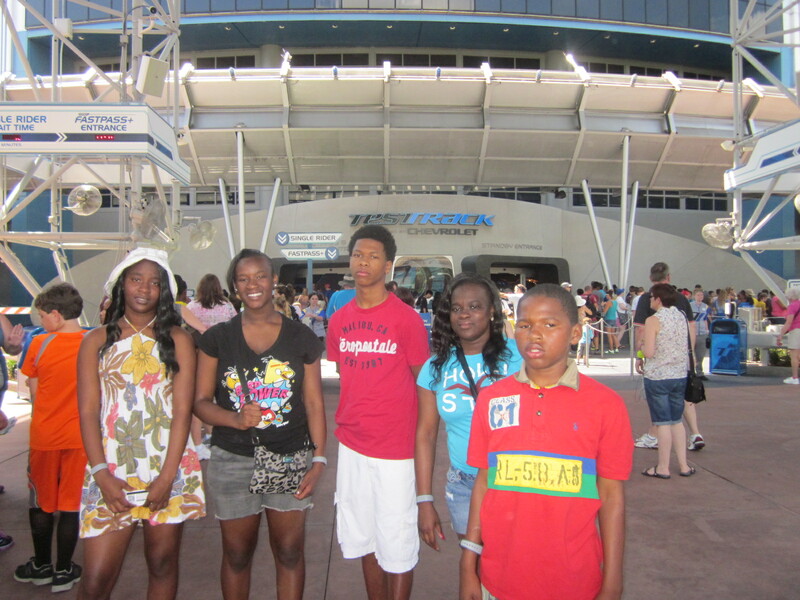 It was the first trip to Disney for Keion and his 16 year old brother Keeron. Keeron is 16 and he has many pulls on his young life, including gangs and drugs. He is steering clear of these and needs the love and connection of the church and youth group to do it. His growing faith has changed him dramatically. He is actively trying to live a Christian life and his witness has recently helped his older brother to return to the church as well. A Disney trip is expensive, but if it helps redeem young lives by showing that we care enough to provide special experiences, it is more than worth it. Jolinda, 16, wrote “I loved every minute of it. But the best part was being together with the group and going on the rides. Some were exciting and some were educational so I actually learned a lot! I am very thankful”! Natasha, 18 wrote: This trip reminded me of how lucky I am to have people who are willing to take me and my family on beautiful trips. How blessed I am to see things that others may never get the chance to experience. I know that I shall remain humble and continue to do the works of God and find a better connection with God because I am experiencing so much because of God. I am so thankful to get away from all of the craziness of Fort Myersand enjoy myself with my Pastors and the group without pressures and worries. It is amazing to have Pastors who enjoy seeing their youth have fun and that love to bring such happiness to us. With much love, Natasha. On June 13th ten young people ages 5-16,and their young adult leader Efe and Linda, a parent, enjoyed a day of activities at the Escape Zone, an indoor amusement area with a skating rink. 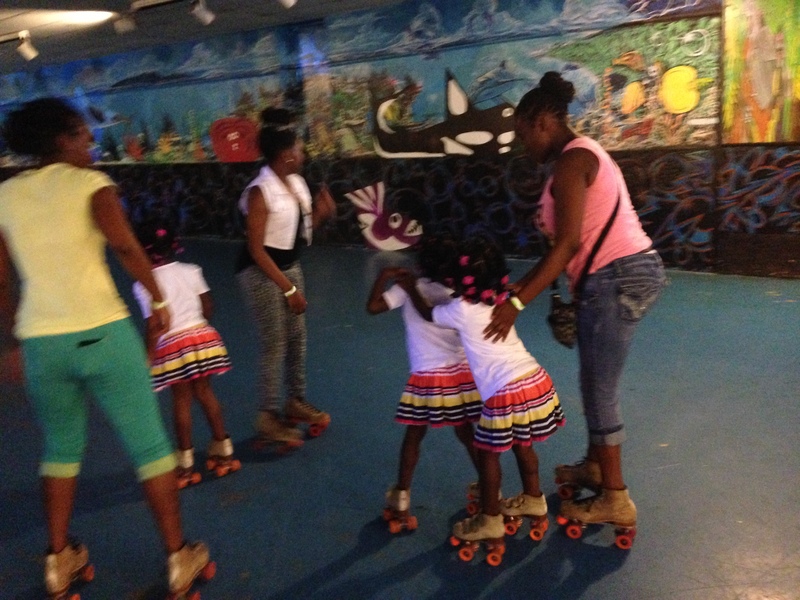 While two of the 12 year olds enjoyed the games of skill, the big hit was the roller rink as most learned how to skate for the first time. 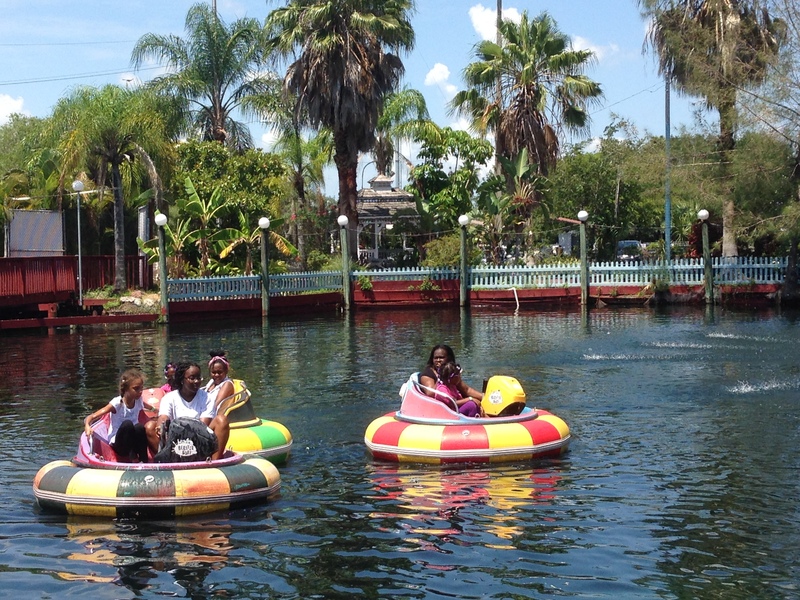 Jolinda, a 16 year old who generally lacks confidence said: “The Escape Zone was a great time. I had fun with the little ones. My favorite part was skating and teaching the little ones as much as I know about skating. I had a good time with everyone and even though I’m not the best skater, I never gave up which is different for me”! Keeondra, the 13 year old agreed that she was so pleased to remember how to skate. Twelve year old Marcella drew a beautiful picture of skates and said “skating was fun even though I could barely skate without the wall. 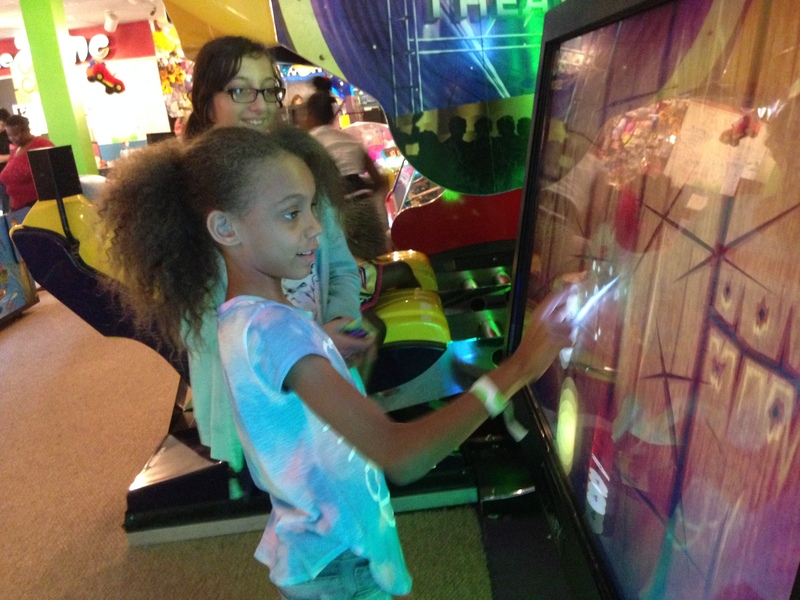 Thanks!” Marcella, like Jolinda, is a youngster who avoids trying new things and gives up easy. Jakeriya, age 12 said “Although I kept falling, I still had fun, thank you!” That day they all learned to persevere and had great fun doing it. The three five year olds drew wonderful pictures of three smiling skaters, even when one fell down! There were very good lessons here. 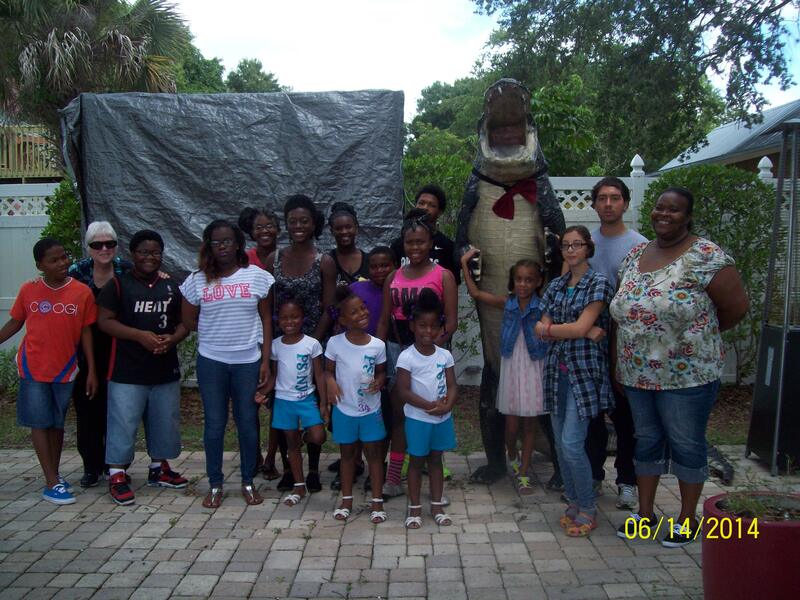 On June 20th nine young people ages 7-18 and youth leader Efe with parent Linda went to Zoomers an outdoor Amusement Park. This was a real treat as it was in another part of Fort Myers and none had been able to go there before. Twelve year old Jakein wrote “ Zoomers was my favorite of all trips so far. We got on two roller coasters that were equally fun. We also went on Go-Karts and even my Mom went on. That was fun!” His older sister Jolinda agreed. “But, spending time with my church family is the best and I look forward to coming each time”. This family has recently faced the terminal health problem of their older brother, they have been filled with sadness and worry. To get away and have fun is such good therapy. Natasha the oldest sister said” “It was so good seeing everyone have fun and smile and laugh. There was something there for everyone. The big kids enjoyed experimenting with driving with the racing cars!” Jakeriya said, “When I looked around and saw the smiles on their faces I knew everyone was happy and getting along. So, thank you, I think everyone bonded on that trip”. Indeed, the bonding as a group is so important to the progress these youngsters are making that will carry over to school and life. Pastor Judy Beaumont attended parts of these two trips and reflected that seeing the older kids help one another and the younger kids to enjoy the attractions was the best part for her. 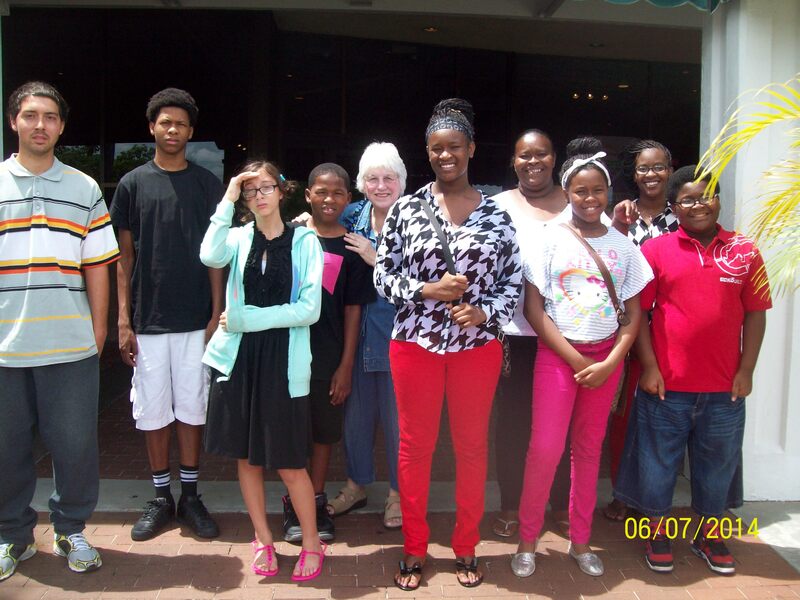 On 6/27 eleven young people ages 5-18, our young adult youth Leader Efe, and parent, Linda visited the Shell Factory where they toured the large outdoor zoo and aviary and then rode the zipline and bumper boats to cool off on the hot day. Keeron, 16 wrote: “Bobcats, racoons, parrots, turtles and owls, I saw them all at the Shell Factory! 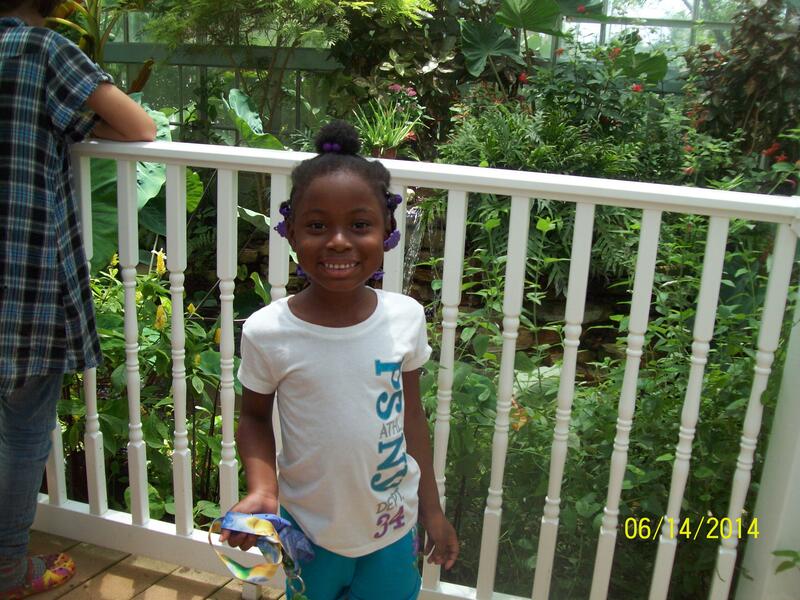 The Zipline was awesome and scary at the same time!” Jakeriya, 12, wrote” Thank you for letting us discover the animals and learn more about them. There were big long snakes and the petting farm with the baby goats. I was scared of the zipline at first, but when I went on it I saw the turtles and fish when I looked down. It was so much fun!” Jolinda said “I liked the black leopard with the green eyes best. But it was the expressions on the little kids’ faces that were priceless: they really enjoyed themselves!” Keion was laughing as Jakein told the story of Keion and the parrot having a screaming contest. He said Keion won the contest, and Keion was pleased to agree! We had prepared for this event for a long time. There was much anticipation and they were not let down. All of the kids read the story of Joseph in the Bible and discussed it several times in their respective classes and groups. On the day of the event, July 10th, they were able to tell the story to the accompanying parents and chaperones. Ten young people ages 7-26, all dressed in their Sunday best, their young adult leader and parents Linda and Debbie with two other church members and both Pastors (a group of 17) enjoyed this musical theater experience. Negotiating the Buffet and the formal table settings was also a pleasurable learning experience. Gaspare, a young adult who has been fearful of leaving his home and joining with others was able to join us accompanied by his sister, Marcella. Both loved the play. Marcella, who wants to be an artist was mesmerized by the sets and the costumes. She also got the plot and loved the acting. 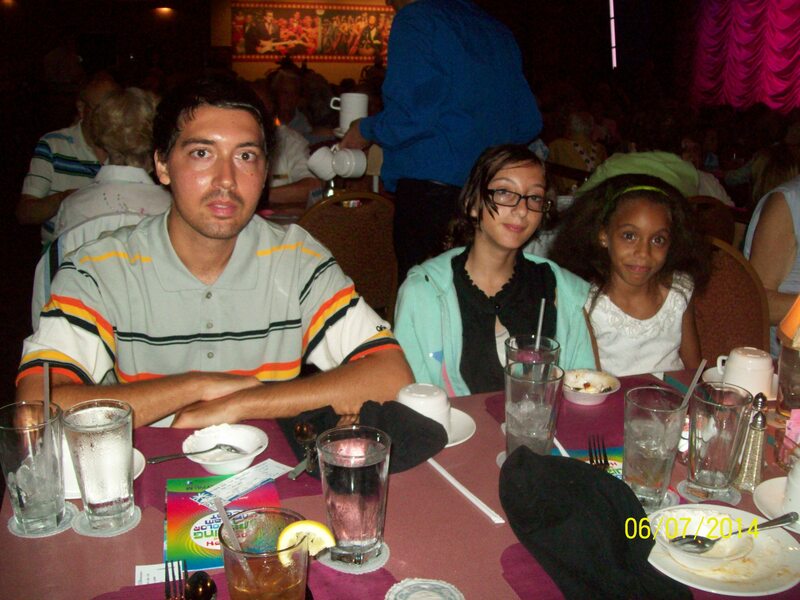 Gaspare said “This was my first Play, a Broadway Musical, and the experience was great! It was very entertaining. It was very creative and the performers are very talented. They did a wonderful job. Joseph helped his brothers despite being treated poorly in the past. Even though he was a slave he was blessed and became powerful in Egypt.”Gaspare was also “poorly treated” in the past and he identifies with a Joseph that can overcome that and “become powerful”. He also reflected “I did have some difficulty because it was so packed but it was a bit easier with my sister. The food was great too. I’m glad I could write and that my mind was able to grasp and enjoy the play. That is progress for me, thank you for inviting me”. Seven year old Joelle and her Mom loved the play. Joelle asked her mother to write that she learned that we must all learn to forgive each other and not be jealous, but to love one another. Her Mom said that they were both so thankful for the experience and that Joelle also identified with the little children on stage and felt she could be in a Play some day too. She practically danced in her seat throughout the show and we had no doubt that she too could learn to act in a Musical Play, They intend to find out when next auditions are. She would be great! Keeron, 16 also identified with the actors, “I once was in a play about William Shakespeare and I did a good job remembering a big role. I enjoyed this play, and the kids in it, and the dancing was great too! They thought they didn’t need Joseph, but they did and he taught them a valuable lesson. ” Mom, Linda, reflected on Joseph’s forgiveness of those who treated him so poorly. “I learned that if God can forgive me for the wrongs I have done, then I can forgive everyone anything as Joseph did. I have carried hate and grudges but when I gave them up and forgave it was a load off my chest”. Jolinda noted “Joseph always had hope no matter what happened to him. He kept hope”! Indeed, as she said, it seemed this joyful and sometimes funny play with a serious theme made each group member feel more hopeful . 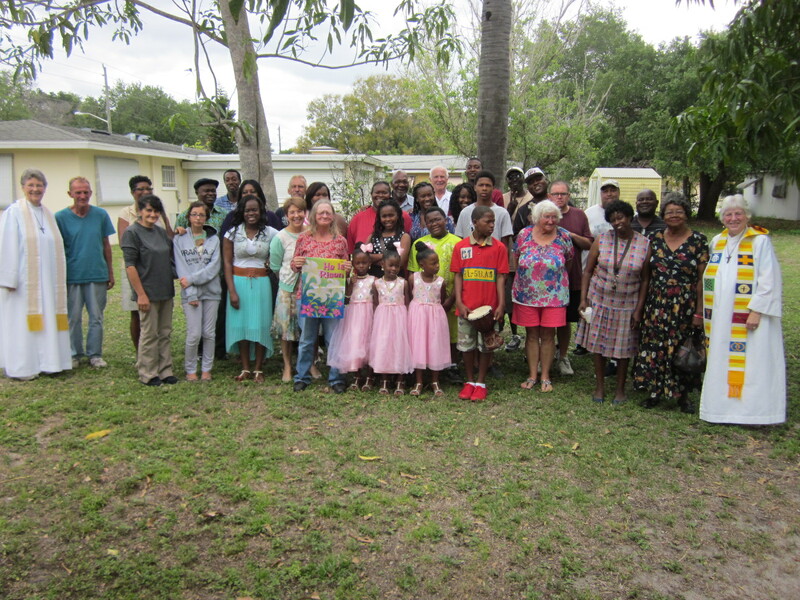 On this day fifteen young people (ages 5-26) and four adults including the Pastors enjoyed an oasis of Nature in downtown Fort Myers. Only one youngster and one adult had been there before. This was an aesthetic and beautiful educational experience. One docent taught about cocoons and butterflies in one area while the other walked the group through a hothouse garden with waterfalls and tropical greenery that house butterflies freely flying. No matter the age each one was fascinated. Ray, age 9, was unusually quiet and took in everything. Then he took my hand and showed me a chart of butterflies and explained all that he learned. I was amazed that this usually hyperactive boy was so moved and thoughtful. Our adults accompanied the younger kids and explained the wonders before them. The littlest girls, the five year olds were entranced. The teens tried hard to take pictures of the butterflies. This was a wonderful experience for all and they then went to have lunch together and see a movie. They had a choice of two movies and they all chose to go together as a group. Once again, Marcella enabled her brother Gaspare to enjoy this group experience. It was well worth the effort. We are extremely thankful to The Father’s Table Foundation for changing the lives of young people this summer, for building hope and learning and joy. 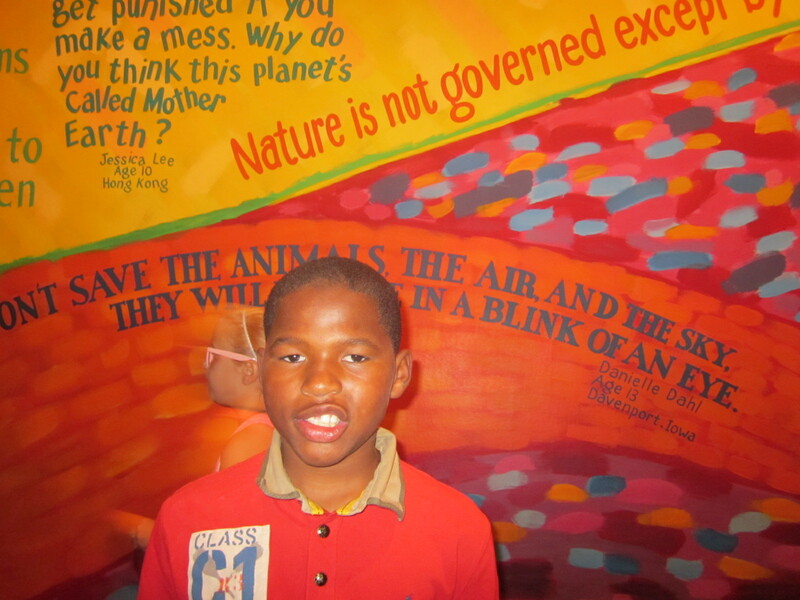 We still have a few trips to go before school starts and afterward will continue our enrichment outings on some basis.